With the Breeders' Cup looming at the end of October, trainer Mark Casse continued to add to his arsenal, as Airoforce won the Grade 3, $250,000 Bourbon Stakes, with stablemate Siding Spring finishing third, continuing the barn's red-hot start to Keeneland's fall meet. 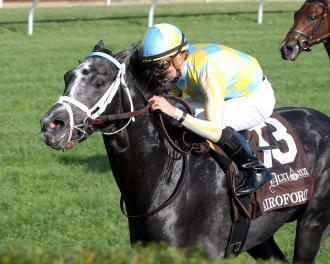 Airoforce earns a berth to the Breeders' Cup Juvenile Turf by winning the Bourbon Stakes under Julien Leparoux. With the victory, Airoforce ($12) earned an automatic berth to the Breeders' Cup Juvenile Turf, to be contested at the Lexington track in less than four weeks. It was the fifth victory in the first three days of the meet for Casse, with three of those coming with 2-year-olds. "We felt like coming in we were bringing some live horses but you never can predict this kind of success," Casse said. Airoforce, owned by John Oxley, and Siding Spring, owned by Gabe Grossberg, were workmates over the summer at Churchill Downs as Casse targeted a fall debut at Kentucky Downs for both. Casse recalled telling Oxley, 'We're gonna run him at Kentucky Downs, I think he's really gonna run well.'." Airoforce won his debut, going six furlongs, by 3 1/4 lengths on Sept. 5 at Kentucky Downs. Eleven days later, it was Siding Spring's turn, as he won by six lengths going a mile. On the strength of his performance, Airoforce was sent off as a tepid favorite in a wide-open field of 14 for the Bourbon, despite stretching out from six furlongs to 1 1/16 miles. Under Julien Leparoux, Airoforce settled in the second flight of horses to track the pace four wide early, as Argot and California invader Hot Ore took the field through an opening half-mile of 47.67 seconds. Airoforce and Siding Spring both began to rally around the far turn, and sat second and third off of Hot Ore with slightly more than a quarter-mile remaining. Airoforce wrested command with a furlong to go and edged clear steadily in the final stages, hitting the wire 2 1/2 lengths in front. His final time for the 1 1/16 miles on turf officially rated yielding after a good deal of rain last week was 1:44.12. Camelot Kitten, making his stakes debut off an impressive debut victory at Belmont, rallied to edge Siding Spring by a half-length for second. Casse indicated after the race that both Airoforce and Siding Spring would run back in the Juvenile Turf,, giving him a trio of prospects for that race, along with Conquest Daddyo, who earned an automatic berth in winning the Grade 2 Summer Stakes at Woodbine.